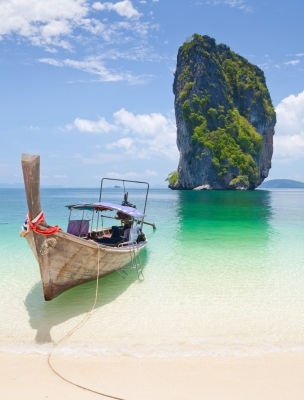 Spotless white beaches, impossibly blue water and scenic islands straight from the painting of some tropical utopia: This is the face of Thailand, according to postcards. Why else would it provide filming locations for James Bond movies and “Survivor“? Thailand’s famously attractive tourist destinations—Krabi, Koh Samui, Phuket, etc.—have brought about this reputation for being a natural paradise. Then there’s Cha Am. When I was a kid, my parents selected this less tourist-frequented beach for our family vacation. It was nothing like the postcards. We had the misfortune of arriving on a rainy weekend, though this wasn’t by any means the end of the world. We waited for the showers to subside and then roamed the beach. The sand was damp and pock-marked, and gray clouds lingered overhead, casting their fat shadow on any hopes we had of a picturesque beach for our vacation. Our silver lining: The weather had scared off so many other vacationers, the place was practically ours. My family and I had a stretch of the beach to ourselves for most of the day, until a clap of thunder prompted us to make our way inland. I realized as we crossed the sand that I had cut my foot on some sharp debris, but the cut was small and I soon forgot about it as we stumbled across a beachside snow-cone stand. The snow-cone stand was a welcome sign of familiarity in a foreign land. We each ordered a scoop and watched the stand owner crush his blocks of ice and then coat the shavings in our preferred flavor of sickly-sweet syrup. Savoring the cheap, satisfying dessert, I felt it had been a good vacation. I would recant that sentiment later when we discovered a sewer canal by the beach that the ocean reached at high tide. Every day, twice a day, the tide would rise, meet the sewer canal and drag untold amounts of human waste with it back into the ocean where we had been swimming. We had been swimming in sewage. The snow cones we ate were no doubt made from that very same water. Our trip home was marred by horrible food poisoning (which would cause us severe discomfort for more than a week), to say nothing of the psychological trauma we suffered at having unknowingly bathed in filth. For a while I could be seen curled in the fetal position, applying iodine obsessively to my foot. Less than a few years after my visit, the Water Environment Partnership in Asia compiled research on the state of water in Thailand. They found the water quality on the coasts was dropping significantly (surprise, surprise). The biggest cause was domestic wastes polluting the rivers and then reaching the gulf. Over a decade later, studies by The World Bank show this is still a problem. If Thailand’s famously scenic locations become like Cha Am, the result will be a blow to environmentalism and to the country’s normally thriving tourism industry. Hopefully that threat is enough to spur on better waste management policies. Things like this endear me to San Marcos. However, my past experience makes me hesitate before grabbing a swimsuit and joining the fun. Sometimes I wonder how many drunks have soiled the river, spilled their beers or dropped their garbage in it. In the hopes of assuaging/confirming my fears, I asked San Marcos River Foundation Executive Director Dianne Wassenich about strange or disconcerting things found in river cleanups. She said they’ve found cars, a motorcycle and even a barrel of hazardous waste dumped outside of town. While it’s irksome to hear about the waste that sometimes ends up where people swim, I have to appreciate the River Foundation’s determination to clear it out. In fact, the San Marcos River owes its very existence to the conservation efforts of groups like Wassenich’s, according to a Texas Reporting article published last spring. The plant species I figured is threatened by careless inner tubers is actually what motivates this community to keep the river there at all, much less clean. Preserving it is no simple task, either. Wassenich said the River Foundation must organize people to regulate the water flow even during droughts. As of last spring, consumption of alcohol in San Marcos parks is prohibited, thereby reducing the use of canned beverages in and around the river, according to an article by San Marcos Mercury. At the same time, Styrofoam materials have also been prohibited near rivers and littering fines have been raised. I doubt this ordinance will stop determined college students from smuggling in the occasional six pack, but it’s a start. Wassenich said protecting central Texas rivers like the one in San Marcos also preserves the coasts, because “most organisms and fish in the Gulf depend on having fresh water to mix with saltwater in the bays, in order to reproduce or grow up.” Even the success of our ocean ecosystems and beach vacations starts with conserving our rivers. Thanks for sharing your thoughts on cleaning.